If you ever wonder, if someone is spying on you from an abandoned building, then there is probably something there. 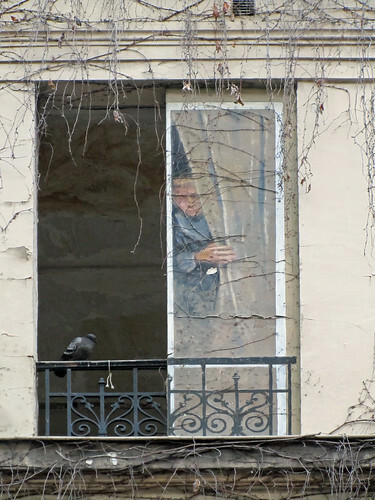 Maybe not a person per se, but possibly a trompe-l’œil that somone is tracking you from behind a small curtain. I guess this can be spooky at night. This building on rue de la Glacière is marked for tearing down and rebuilding. Cranes can be seen peeking through the metal barrier put up to prevent public wandering onto a building site. There is an air of neglect, which made this trompe-oeil even more striking. Can you feel the loneliness radiating from this boy behind his hiding place?